Hydrostatic drive with 4 wheel steer. The excellent sweeping performance and extreme manoeuvrability make the Hako Citymaster 300 the optimum economical solution for city cleaning. It’s unique Sulo bin hopper concept makes it the most versatile footpath and outdoor sweeping machine on the market today. For more sweeping and less transit time. 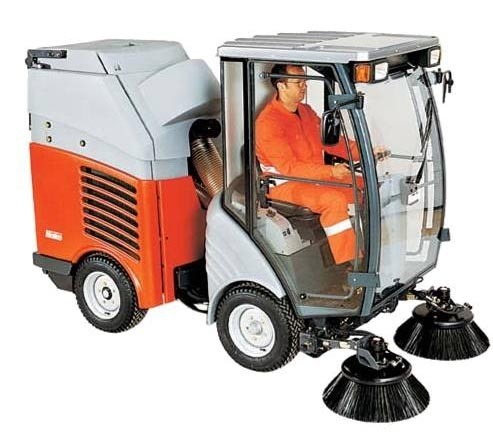 The Hako Citymaster 300 has a choice of flexible disposal concepts that allows the most efficient sweeping option to be determined in line with your work practices. The ergonomically designed operators cabin that is lockable for operator safety, has an excellent 240 degree all round view. It is a sound-proofed low vibration suspended cabin, all controls are in direct view and reach of the operator. With PM10 certification for dust emissions coupled with its unique articulated design, its extreme manoeuvrability is unmatched. Footpath and outdoor sweeping couldn’t be any easier than with the Hako Citymaster 300. Service – friendly easy access to all components. The rubbish bin concept of the CM 300 leaves nothing to be desired. As a result of the hydraulic lowering and lifting device on the Citymaster 300 the full rubbish bins can be removed from the machine easily and an empty rubbish bin can be replaced quickly and easily. With this device any standard 240l rubbish bin can be used. With the flexible hand-held wander hose (optional extra) you can quickly reach even the furthest corners and most inaccessible areas. Improved suction performance even with heavier dirt as a result of the 2 part mesh metal filter, made of V2A steel, which guarantees a long filter life and low filter servicing costs. Wheel controlled suction nozzle suspended between front wheels, air recirculation increases efficiency, hydraulic dustbin changing, hydrostatic drive assembly. There are a number of options available like a wander Hose, Reverse Camera with colour monitor and various types of Disc Brushes.